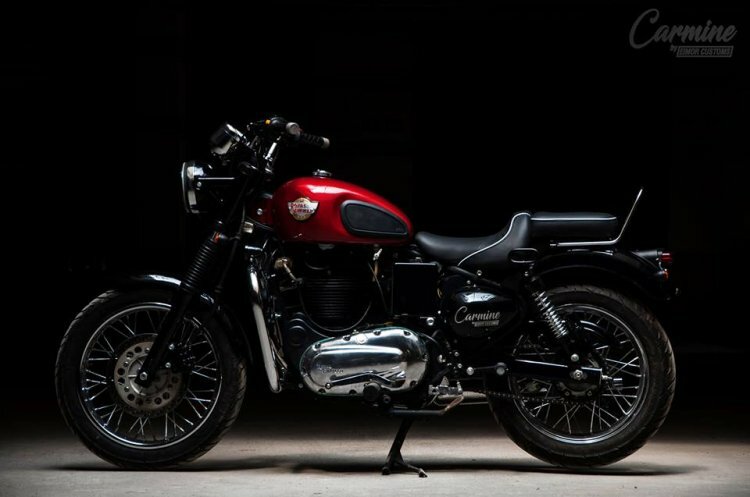 A 2006 Royal Enfield Electra 5S was given a complete makeover by the folks at Eimor Customs to make it look more desirable than ever before. Christened as Carmine, this Electra drops its subtle styling and packs updates ranging from wider front shocks to a rear disc brake. The Royal Enfield Electra receives a complete makeover from Eimor Customs. Changes include the new front forks, headlamp, fuel tank, and the seat among others. Carmine is not just a deep and bright shade of red, but it is something which defines elegance, suavity and class. The fascia is dominated by a heavy-duty headlight sourced from Truck-Lite USA and comes with a chrome mask. Auxiliary lights from ADVMonster USA further enhance illumination. The stock blinkers have been removed for more compact units that are sourced from Lucas Tail Light from Hong Kong and placed next to the front registration holder. Behind the headlamp is a twin-pod instrument console instead of a single, factory-installed unit. A taller handlebar gives more upright and comfortable ergonomics than the standard bike, lending the motorcycle a cruiser-like persona. 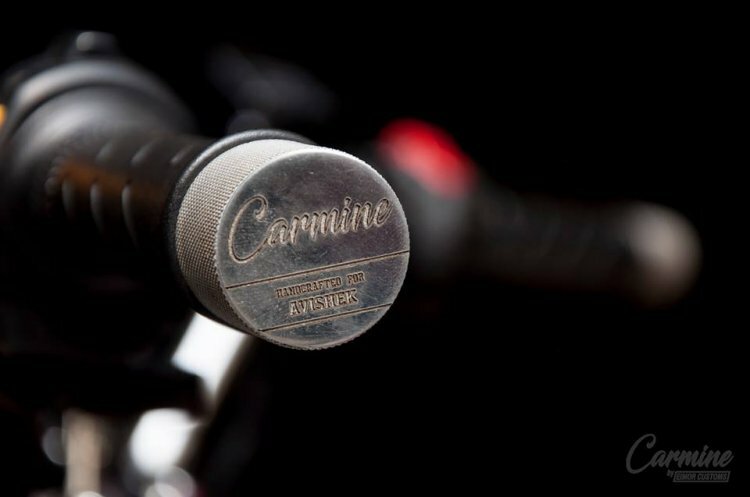 The custom bar end weights get the 'Carmine' tag along with the name of the owner. A custom-made fuel tank features a 3D Royal Enfield branding while the design traits now include knee recesses with tank pads. An asymmetrically placed, chrome finished filler cap adds to the unique look of the Carmine. Following the fuel tank is a custom saddle that gets a hump in the centre to provide extra comfort to the rider. A raised grab rail follows the relatively simple pillion seat. The black seat cover features white borders that look very appealing. Compact blinkers, similar to the units installed at the front, are also seen on the back. Sides reveal custom crafted side boxes with Carmine name painted in style. Noticeable changes from the sides also include resized wheels that are wrapped in MRF Masseter soft compound tyres. The name of the motorcycle and the owner carved into the bar end weight adding a personal touch to the customisation job. Suspension duties are performed by wider front forks that replace the stock units while at the rear are twin sided springs. Braking department, too, gets an upgrade and unlike the standard Electra, Carmine benefits from a disc brake at the back. A single disc brake provides stopping power at the front.